Some of you reading this might be experienced small-scale organic farmers questioning techniques that look a lot like conventional agriculture with excessive use of machinery. Others might be new to, or seeking to enter farming with, a connected, sacred relationship to the soil. On the first farm I owned in the 1980s we used tractors. It was “organic” but the pace and lifestyle was not sustainable. On my second farm where we remain today, I wanted to farm where nature led the way over machinery. With proper planning and thinking ahead I have been able to create a no-till system that is successful without machinery and lets nature do more of the work. No till using a silage cover. The central bed has just had the silage cover removed — note the dead biomass. In the bed on the left compost has been layered on top of the biomass and it is ready to plant with garlic. To the right the silage cover is still in place. Worms are one of my greatest passions; they are one aspect of farming that keeps me excited after 30 years. Worms have been my greatest allies in transforming forested, acidic land marginal for growing vegetables into balanced and rich agricultural soil. The best soil in our region—a fertile valley- was flooded in the late 1930s to create the Quabbin Reservoir. So worms have been key to our success in building rich soil. I tell groups that visit our farm that building soil on land that is not considered agricultural is critical. River bottomland, once so sought after, is now getting 100-year floods three years in a row. The chances are high of GMO drift when growing in an established farm community, and the price of good farmland when you are competing with housing lots and Home Depots is usually out of the question. In addition, urban land and lots are often places where soil needs to be microbe-cleansed and fertility built, and the practices I describe are applicable in these settings as well. Seeds of Solidarity’s motto is Grow Food Everywhere, and if we are to truly feed ourselves and communities we can’t just depend on existing farmland but must create community-based gardens and small farms in as many settings as possible. No-till growing practices that create and enhance a living soil rich with worms, microbes, and mycorrizal fungi are key to a much needed, sacred relationship with the soil that feeds us. Here are some worm facts that excite me, excerpted from The Farmers Earthworm Handbook by David Ernst: Twenty-five earthworms per square foot equals one ton of worms per acre. One ton of worms equal 100 tons of castings, or 2/3 inch of castings on the soil surface, per acre, per year. Earthworm castings contain five to ten times the amount of soluble plant nutrients as the original soil. This action alone may increase soil test results for calcium, nitrogen, phosphorus and potassium. Alchemy! As the worms tunnel through the soil, their mucus leaves sugars that bacteria feed on, and the carbon that they bring down increase the fungi. 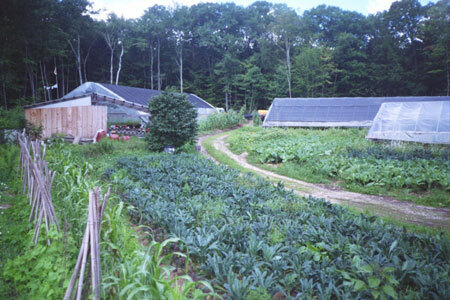 With no real soil, we had to be very creative to start and grow a farm out in the woods of Orange, Massachusetts. Worms, microbes, and fungi were to be my best allies and I knew that tilling was not the way to enhance these populations. After 20 years on our land in Orange I’ve come up with two primary techniques, my most important tools in the no-till toolbox to grow food for market, build soils and a huge worm population. I am a worm farmer, not in the traditional sense of raising worms in bins and tanks, but throughout all of our growing beds. My philosophy is to keep adding organic matter above the soil, and not tilling the soil. I will share with you the two techniques that allow me to do no-till and farm with worms simultaneously. My favorite is the cardboard method. Cardboard is my way to open up new land, my weed control, moisture control, and worm food that results in nutrient rich castings—my primary fertilizer. I’m talking large sheets from furniture or appliance stores. One full load in my F350 pick up truck will cover an area 35 by 100 feet that I then cover with mulch hay. I’ve used cardboard in many ways, at all times of the year, under beds, as mulch, dibbling through it. I call it the no-till self-sustaining cardboard method. In the areas where I have been using cardboard for at least five years, the growing beds have become established and rich, so that I have been able to cut out compost, seeing that the cardboard and subsequent worm activity is enough to feed the plants. This has been working wonderfully on crops such as garlic, corn, brassicas and winter squash. This is huge in regards to the cost of acquiring compost or other fertilizers as well as labor! My greatest joy is showing people around the farm at all the areas where cardboard has been laid and the look of amazement when folks see the amount of worms and the layer of castings under the cardboard. They are also blownaway to see that in most of our soils I can now stick my arm in up to my forearm with ease. A common question that people ask is whether cardboard is safe and when using corrugated cardboard with soy inks and hide glue (high in protein which also attracts the worms) it is safe and promotes soil life. To learn more about the specifics of our cardboard techniques check out http://seedsofsolidarity.org/growing-food/ where you will find our video and resources including results from our SARE research on using cardboard as mulch. My second tool in the no-till toolbox is what many growers in Europe call occultation- the use of darkness. Most everything I plant with transplants gets cardboard on the bed. But if I want bare ground to sow cover crops or scatter sow seed for salad greens such as in our hoophouses without having to remove the cardboard I use silage covers. Silage covers come in sheets as large as 40 x 100. These are much thicker and more durable than regular black plastic and last many years. I use silage cover both in the field and hoophouses. Outside, after I’ve harvest my garlic, I can cover the expanse with one 40 x 100 ft sheet, putting it right over any weeds that were in the beds or since grown. Weeds germinate in the warm, moist conditions generated by the tarp, but are then killed by the absence of light. Two months later, all the weeds have become a layer of broken down biomass that I can transplant right into without needing to till or remake raised beds which is an enormous labor saver. As most know, every time one tills weed seeds that have never seen the light of day come to the surface. So with each tilling we are supporting a new crop of weed seeds in growing. A beauty of silage covers is that the previous crop becomes a carpet of biomass that will create a barrier for many of the weeds still in the bed, and as long as I add clean compost above the biomass into which I plant, I have minimal weed issues. cardboard mulch and worm hotels, and hoophouses. 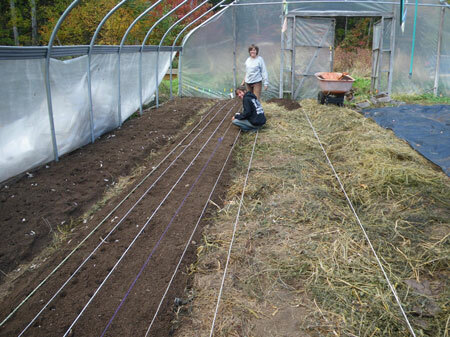 My experiences parallel those of Jean Martin Fortier, author of The Market Gardener, who proposes that soil-covering tarps are as effective at fighting weeds as a short cover crop in a typical vegetable rotation, but they can be set up in one go. I too have found that they work immediately and quickly, and are the perfect fit for intensive market gardening. I also use the silage covers in our four, 30 x 96 foot hoophouses where we do greens production. The heat of the hoophouse really speeds up the breakdown. To achieve no-till previously, when a bed of greens such as lettuce, arugula or spinach was done I would hoe, then need to rake all of that biomass out of the hoophouse. The last couple of seasons I cut some silage cover the width of the beds and let it sit on the bed on top of the spent crop for 2-3 weeks. All the green matter becomes brown and I cover this biomass with a 1/2-inch layer of compost and begin the sowing process. A commonly asked question about silage covers is how they affect the worm population, especially when used in the heat of a hoophouse during the summer months. This past season I really got to test this, as I had wondered the same. One day I looked under all of the dead biomass of the previous greens crop, after two weeks under a silage cover. The biomass was moist and the soil below it cool, creating a perfect environment for worms to do what they love: eat, reproduce and poop, with a wonderful new layer of castings produced. These two techniques- the cardboard method and the use of silage covers for occultation– allow all of our land and greenhouses to be undisturbed and allow the worms, microbes and fungi to continue to thrive unimpeded. • Earthworms become dormant as soil dries, but with soil covered with cardboard and/or silage covers on top of biomass, they stay very active. • Earthworms are fully able to live in soil that is actually frozen- but they don’t develop this resistance until late December. The cardboard and silage covers moderate the soils and keep them warmer especially as biomass breaks down underneath. This I believe is critical to enhance year-round worm farming out in the field. If you are tilling when the worms are emerging from their cocoon they don’t have the body weight to survive while they hunt for food and build burrows. • Tillage crushes soil aggregates and breaks apart the webs of microbial fungus hyphae and reduces fungus abundance. • Tillage selects the fungus species that don’t aggregate soil particles well. • By reducing fungus abundance and selecting for ineffective species, tillage undermines the biological repair mechanisms required to restore soil structure. • Tillage promotes dependence on fertilizers. Reducing abundance of microbial fungi, tillage undermines the biological mechanisms for nutrient uptake. Microbial fungi can increase the yield in an area of land by 30% or more. • Tillage reduces soil fungus communities by 27%. After only a few years without tilling, soil with perennial plants can have a fungus community that is as diverse as a native prairie. For those out there who would like to use your hands more and machinery less or not at all, decrease labor inputs due to many less weeds, reduce exported fertilizer inputs, and eliminate release of CO2 from tilling, these techniques may be for you. As farmers it is critical to keep ourselves healthy for the long haul, and leave land better than it was when we started working it. After farming for 30 years, the practices I’ve developed, arrived at, continue to explore, and love to share nourish me as a human being by creating an honoring relationship with the soil, one that enhances life. Ricky Baruc will be offering a workshop on ‘No-till Farming for Life’ in April 2016 at his Massachusetts farm, Seeds of Solidarity. to receive the date and register.